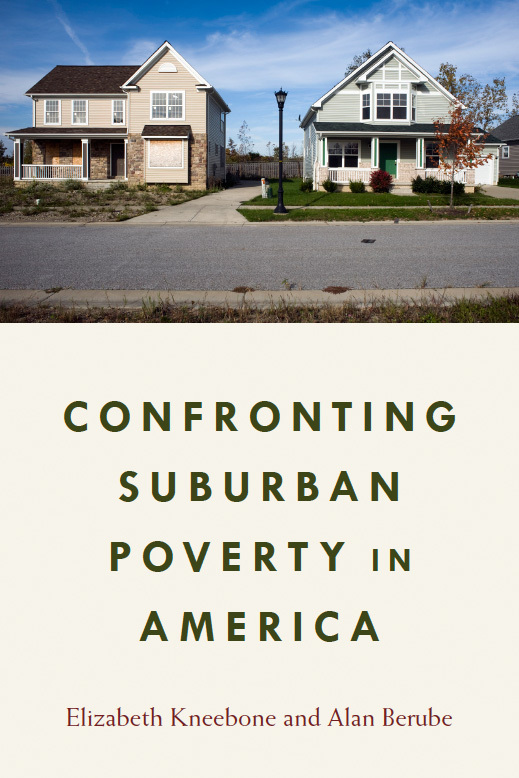 Family poverty has spread beyond its traditional geographic boundaries, and our institutions and policies need to adapt to this new reality, reads the powerful new book from the Brookings Institution, Confronting Suburban Poverty in America. As the report points out, more poor people now live in suburbs than in central cities. There is both good news and bad news in this trend. The good news is that more poor families are living outside of the most concentrated poverty neighborhoods, in areas with better schools and lower crime rates. The bad news is that we are still allowing some higher opportunity suburban towns to exclude low-income families, which will inexorably lead to re-concentration and re-segregation in older suburban towns. A small but increasing number of suburban communities have poverty rates exceeding 20 percent. These numbers reinforce the importance of regional housing strategies to open up new opportunities for low-income families and avoid re-segregation. Each suburban community needs to do its fair share, especially our most wealthy communities. As the report makes clear, we also need to develop better regional systems for delivering services to low-income families, services that are not tied to specific city neighborhoods. In spite of the report's “headline” about increasing suburban poverty, we also need to remember that concentrated poverty in our cities is persisting, and even expanding. The families living in these city neighborhoods continue to need help to move out of poverty. The Brookings report highlights the role of the Section 8 Housing Choice Voucher (HCV) program in increased suburban poverty. But instead of offering families a real choice, including high-opportunity communities with excellent schools, the HCV program has tended to concentrate poor families in lower opportunity, distressed suburban communities (in addition to lower opportunity city neighborhoods). The authors of the report repeat the longstanding recommendation that HUD should work to consolidate fragmented local Section 8 administrators into regional housing agencies. This kind of regional consolidation, coupled with an active mobility strategy and improved voucher rent structures, will also help to stabilize more distressed suburban communities. The Poverty & Race Research Action Council (PRRAC) applauds the report's emphasis on creating a more regional approach in some of our other key housing programs: the Low Income Housing Tax Credit, the HOME program, and the Community Development Block Grant program. HUD's current Sustainable Communities Initiative is trying to do this on a small scale now, but the Brookings report recommends taking this a step further and creating a new competitive grant program they call the “Metropolitan Opportunity Challenge,” using 5 percent of existing federal funds to create incentives for state and local governments and nonprofits to collaborate and take on regional poverty challenges in creative new ways. While the Brookings idea for a “Metro Opportunity Challenge” fund is promising, we need to recognize that it only affects, at its most ambitious, 5 percent of federal “place-based antipoverty funding.'' We also need to pay attention to the remaining 95 percent of place-based funding, which in the past has tended to drive segregation and poverty concentration. One area where the Brookings report falls somewhat short is in its failure to recommend responses that directly address race and racial segregation. Although the report notes that white families still make up the majority of the suburban poor, an increasing number of low-income families of color are moving into suburban areas. In 2008, the National Commission on Fair Housing highlighted diverse older suburbs as presenting an important opportunity for stable long term racial integration, but the dynamics of “white flight” and “tipping” are still with us, and will continue to be with us as long as we have racial discrimination and steering in real estate markets and exclusionary zoning keeping lower cost housing out of some communities. Strong fair housing enforcement needs to be included in any strategy going forward and HUD needs to issue a strong “Affirmatively Furthering Fair Housing” rule that will set clear expectations for suburban communities with growing poor populations. The Department of Education also has an important role to play in insisting that diverse suburbs maintain internal school integration, and work collectively with other school districts in the region to avoid re-segregation. One possible silver lining in the report is the way that poverty is becoming much more visible in more of our communities. It is becoming harder for middle class families and voters to “look the other way,” with poverty safely confined to far away city neighborhoods. This new visibility could have the effect of finally moving a national conversation about reducing poverty. It will also make it more difficult for more privileged Americans to demonize and stereotype the distant poor. As the Brookings report emphasizes, we are at a crucial moment of opportunity now in the evolving story of suburban poverty, and we need to move quickly to avoid repeating the mistakes of the past. We need to plan intentionally to shape more equitable regions and ensure that low income families have a secure home in all of our communities and long term hope for moving out of poverty. This post originally appeared on Huffington Post. For a different perspective on Confronting Suburban Poverty in America, check out these other posts, including a response from the authors, Elizabeth Kneebone and Alan Berube, on Rooflines. What if someone just figured out how to bring jobs back to the US and employ the millions of impoverished people we have here? That’d be great.